About 40 faith-based communities in the Madison area take responsibility for one meal per month. Our meal is served the first Monday each month. The program has one full-time coordinator: Paul Ashe. 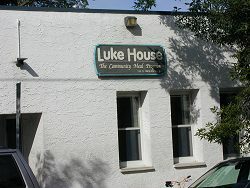 Luke House is located at 310 S. Ingersoll on the Isthmus — just off Williamson St. about 2 blocks from the Willy St. Coop. Memorial members and friends provide the food, prepare the meal, serve and share the meal with the guests, and clean the facility afterwards. We serve a sloppy joe dinner with corn, lettuce salad, bread, cookies, milk, and coffee. Volunteers are coordinated by Dean Baumgardner. Volunteers bring food from church about 3:30 and others arrive at Luke House around 4:45 p.m. to set tables, and prepare food for serving. Our work is done about 7 p.m.. Children and older youth are encouraged to help and enjoy the experience and the meal. You are invited to help in this important outreach program, by preparing food, donating food or money to purchase food, or to serve the meal. Contact Dean by email to volunteer.